Þröstur Þorsteinsson og Hrund Ó Andradóttir. 2018. Fyrirlestur, Umhverfis-og skipulagssvið Reykjavíkurborgar, Kerhólum, Borgartúni 12-14, 13. Desember, 2018. Flugeldar og flugeldamengun – kynning á nýrri rannsókn. Opinn fyrirlestur, Háskóli Íslands, N-132, 21 September 2018. MARY K. BUTWIN, Melissa A. Pfeffer, Throstur Thorsteinsson, Sibylle von Löwis. 2018. The Size Distribution and Physical Characteristics of Surface Material in Iceland. Mary Butwin, Melissa Pfeffer, Sibylle von Löwis, and Throstur Thorsteinsson. 2018. Frequency and Characteristics of Volcanic Ash and Dust Suspension Events in Iceland. Cameron Powell (MS student of Throstur). 2018. IMPROVEMENTS IN NAME ASH RESUSPENSION FORECASTING. IceDust Workshop II, Workshop of the Icelandic Aerosol and Dust Association 14 February 2018 Agricultural University of Iceland. Mary Butwin (doctoral student of Throstur). 2018. Natural sources of particulate matter in Reykjavik. International Conference on High Latitude Dust 2017, University of Iceland, 22 - 25 May 2017. Mary Butwin, S. von Löwis, M.A. Pfeffer, Throstur Thorsteinsson. 2017. Frequency of Dust and Volcanic Ash Resuspension Events. Throstur Thorsteinsson (M Baddock, T W Mockford, J Bullard). 2016. Workshop of the Aerosol and Dust Association in Iceland, The LBHI, Arleynir 22, Keldnaholt, 13 December 2016. Thomas W Mockford, Joanna Bullard, Throstur Thorsteinsson. 2016. Characteristics of Icelandic Dust Sources: Particle Size, Morphology and Geochemistry. ICAR IX, 3-8 JULY 2016, MILDURA, AUSTRALIA. Abstract. Matthew Baddock, Joanna Bullard, Tom Mockford, Santiago Gasso, Throstur Thorsteinsson. 2016. The Icelandic Dust Cycle: insights from remote sensing and air parcel trajectory modelling. Throstur Thorsteinsson, T. Mocford, J. Bullard, S. von Löwis. 2016. Airborne dust from source to city. 2016Vorráðstefna Jarðfræðafélags Íslands, Háskóli Íslands, 8 April 2016 . Dagskrá. Monika Dragosics, Christine Groot Zwaaftink, Throstur Thorsteinsson, and Andreas Stohl. 2016. Dust events on Vatnajökull, Iceland: comparison between model results and measurements. EGU General Assembly 2016. Vol. 18, EGU2016-452-1, 2016. Monika Dragosics, Outi Meinander, Tinna Jónsdóttir, Tobias Dürig, Gerrit De Leeuw, Finnur Pálsson, Pavla Dagsson-Waldhauserová, and Throstur Thorsteinsson. 2016. Insulation effects of Icelandic dust and volcanic aerosols on snow and ice . EGU General Assembly 2016. Vol. 18, EGU2016-211, 2016. Jamie McQuilkin, Ragna Benedikta Garðarsdóttir, Þröstur Þorsteinsson and Shalom H. Schwartz. 2015. An Icelandic translation and validation of the revised 19-value Portrait Values Questionnaire. Þjóðarspegillinn 2015, Háskóli Íslands 30. október 2015. Dagskrá. J. Bullard, M. Baddock, S. Gasso, and Throstur Thorsteinsson. 2015. Spatial and Temporal Variations in Icelandic Dust Emissions: a decade of insights from MODIS. Throstur Thorsteinsson, T. Mockford and J. Bullard. 2015. From Source to City: Particulate Matter Concentration and Size Distribution Data from an Icelandic Dust Storm. Þröstur Þorsteinsson and Brynhildur Davíðsdóttir. 2015. Baloise Group workshop in Harpan, Reykjavík, Oktober 1st, 2015. T. Mockford, D. Graham, J. Bullard, R. Wackrow, Throstur Thorsteinsson. 2015. CHARACTERISING HIGH LATITUDE COLD CLIMATE DUST SOURCES: A FIELD STUDY FROM MARKARFLJOT, SOUTH ICELAND. UK ARCTIC SCIENCE CONFERENCE 2015, The University of Sheffield, 16th – 18th September 2015. Olafur Rognvaldsson, Gylfi Arnason, Thorgeir Palsson, Jonas Eliasson, Konradin Weber, Christoph Böhlke, Throstur Thorsteinsson, Lukas Tirpitz, Ulrich Platt, Paul D. Smith, and Roderic L. Jones. 2015. Modeling of SO2 dispersion from the 2014 Holuhraun eruption in Iceland using WRF-Chem. EGU General Assembly 2015, Vol. 17, EGU2015-10113, 2015. Gylfi Arnason, Jonas Eliasson, Konradin Weber, Christoph Boehlke, Thorgeir Palsson, Olafur Rognvaldsson, Throstur Thorsteinsson, Ulrich Platt, Lukas Tirpitz, Roderic L Jones, and Paul D Smith. 2015. Results of airborne measurements in the plume near and far from the 2014 Bardarbunga-Holuhraun eruption. EGU General Assembly 2015, Vol. 17, EGU2015-5553, 2015. Konradin Weber, Jonas Eliasson, Gylfi Arnason, Olafur Rognvaldsson, Throstur Thorsteinsson, Thorgeir Palsson, Christoph Böhlke, Christian Fischer, Paul Smith, Roderic Jones, Lukas Tirpitz, and Ulrich Platt. 2015. Airborne Investigations and WRF -Model Calculations of the Bardarbunga-Holuhraun Eruption Plume. EGU General Assembly 2015, Vol. 17, EGU2015-10846, 2015. Guðmunda María Sigurðardóttir, Sibylle von Löwis, Baldur Bergson, Þröstur Þorsteinsson, and Þorsteinn Jóhannsson. 2015. Measurements of volcanic aerosols during the Holuhraun eruption in Iceland. EGU General Assembly 2015, Vol. 17, EGU2015-, 2015. Monika Dragosics, Throstur Thorsteinsson, and Finnur Pálsson. 2015. Albedo changes on Vatnajökull associated with dust events, Iceland. EGU General Assembly 2015, Vol. 17, EGU2015-10355-11, 2015. Árstíðabreytingar í tíðni gróðurelda á Íslandi (Seasonality of wildfires in Iceland). Vorráðstefna JFÍ, Askja, 13 March 2015. HLCCD Network Meeting, Loughborough University, UK, 25 - 27 February 2015. Ferðafélag Íslands, Mörkinni 6, 18 February 2015. Monika Dragosics, Þröstur Þorsteinsson, and Finnur Pálsson. CRAICC Annual Meeting, Stockholm, Sweden, 21 - 23 October 2014. Monika Dragosics, Þröstur Þorsteinsson, Finnur Pálsson, Gerrit de Leeuw, and Andreas Stohl. Þröstur Þorsteinsson, Hanne Krage Carlsen, Ragnhildur G Finnbjörnsdóttir og Þórarinn Gíslason. Tengsl ösku- og sandfoks við innlagnar á bráðadeild Landspítala Háskólasjúkrahús í Reykjavík. Lýðheilsa 2014, í húsnæði Endurmenntunar Háskóla Íslands, Dunhaga 7, 28. febrúar 2014. Er gróðurinn vopnið gegn svifryksmengun? Í býtið á Bylgjunni, 28. febrúar 2014. Pavla Dagsson Waldhauserova, Haraldur Olafsson, Olafur Arnalds, Lenka Skrabalova, Gudmunda Sigurdardottir, Martin Branis, Jindrich Hladil, Leona Chadimova, Roman Skala, Tomas Navratil, Sibylle von Lowis of Menar, and Throstur Thorsteinsson. Physical properties of suspended dust in Iceland. CRAICC workshop, CRAICC, Copenhagen, 14-15 January 2014. H2S á höfuðborgarsvæðinu: Styrkur, áhrif veðurs og viðmiðunarmörk. ÁHRIF BRENNISTEINSVETNIS Á UMHVERFI, HEILSU OG HAGKERFI, Félag umhverfisfræðinga á Íslandi, Hvammi, Grand hótel Reykjavík, 25. september 2013. Monika Dragosics, Throstur Thorsteinsson, H. Björnsson, S. Guðmundsson, E. Magnússon and F. Pálsson. The sources and influence of aerosols in the Arctic on glacier energy balance. CRAICC, Aarhus, 19-21 August 2013. Dagsson-Waldhauserova Pavla, Skrabalova Lenka, Sigurdardottir Gudmunda Maria, Olafur Arnalds, Branis Martin, Olafsson Haraldur, Von Löwis of Menar Sibylle, Thorsteinsson Throstur, Krage Carlsen Hanne. Atmospheric dust measurements in Iceland (ADMI 2013). NORDVULK SUMMER SCHOOL 2013: Remote sensing techniques in a dynamic geological setting, Nordic Volcanological Center, Institute of Earth Sciences, University of Iceland. Venue: Kríunes, Kópavogur, Iceland, 17-24 August 2013. Viðtal við Martein Sindra Jónsson, í þættinum Sjónmál á Rás 1, 26. júlí, 2013. H2S in the Reykjavik area. 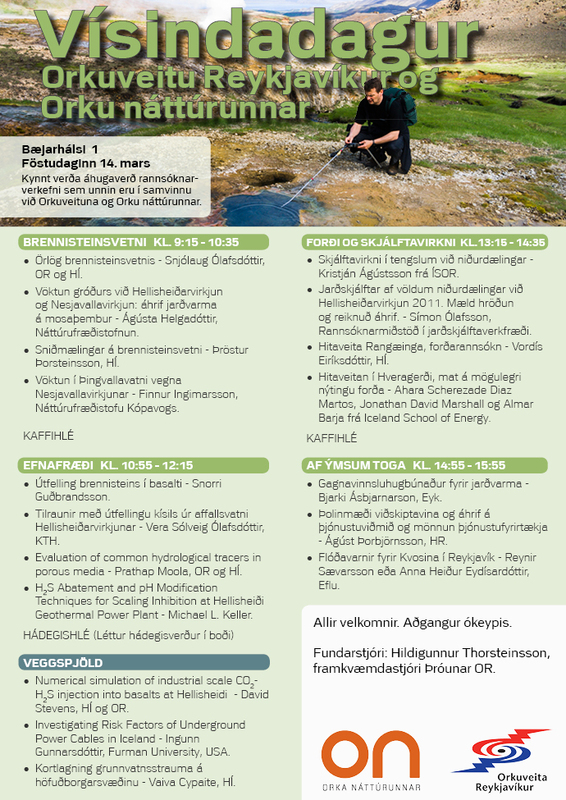 RHINE meeting, Tuesday 11 June 2013 – Blásalir, LSH, Fossvogi. Throstur Thorsteinsson, H Björnsson, S Guðmundsson, E Magnússon, G Aðalgeirsdóttir and F Pálsson. Basal sliding related to water flux reaching the bed. Final Ice2sea Open Forum, London, 15-16 May 2013. Þröstur Þorsteinsson, H Björnsson, S Guðmundsson, E Magnússon, G Aðalgeirsdóttir and F Pálsson. Botnskrið jökla tengt breytileika í framboði vatns á botni. Vorráðstefna Jarðfræðafélags Íslands, Askja, 22 March 2013. Þröstur Þorsteinsson og Þorsteinn Jóhannsson. Málþing um gróðurelda, fimmtudaginn 17. janúar 2013 – Hjálmakletti í Borgarbyggð. Glacier sliding related to fluctuations in water availability. "Northern Hemisphere Glaciers: Past, Present and their Future Fate" - Helgi Björnsson 70th year anniversary, Hátíðarsalur HÍ and Askja, 12 January 2013. Sverrir Gudmundsson, Finnur Pálsson, Helgi Björnsson, Eyjólfur Magnússon, Throstur Thorsteinsson and Hannes H. Haraldsson. The impact of volcanic aerosols on the energy- and mass balance of Langjökull ice cap, SW-Iceland. Málþing: Landheilsa - Loftgæði - Lýðheilsa, Askja, 16. nóvember, 2012. Vísindavaka, Háskólabíó, 28. september, 2012. Energy: Geothermal energy in Iceland. Sustainability and science education - NorSEd. 23 April 2012. Áhrif veðurfars á dreifingu brennisteinsvetnis frá jarðhitavirkjunum. Vorráðstefna Jarðfræðafélagsins 2012. 30 March 2012. Eyjólfur Magnússon, Helgi Björnsson, Finnur Pálsson, Sverrir Guðmundsson, Snævarr Guðmundsson, Hrafnhildur Hannesdóttir, Þröstur Þorsteinsson, Thomas Nagler, Etienne Berthier, Cyrielle Guérin, Jón Ólafsson og Tómas Jóhannesson. 2012. Breiðamerkurjökull og Jökulsárlón á Breiðamerkursandi. Rannsóknarstofa í jöklafræði við þjóðveg 1. Haustráðstefna Jarðfræðafélags Íslands, 5-7. október 2012. Sverrir Guðmundsson, Finnur Pálsson, Helgi Björnsson, Eyjólfur Magnússon, Þröstur Þorsteinsson, and Hannes H. Haraldsson. Áhrif ösku úr eldgosunum 2010 og 2011 á orkubúskap og afkomu Langjökuls. Hrafnhildur Hannesdóttir, Helgi Björnsson, Finnur Pálsson, Sverrir Guðmundsson, Snævarr Guðmundsson, Hrafnhildur Hannesdóttir, Þröstur Þorsteinsson, Thomas Nagler, Etienne Berthier, Cyrielle Guérin, Jón Ólafsson og Tómas Jóhannesson. Breiðamerkurjökull og Jökulsárlón á Breiðamerkursandi. Rannsóknastofa í jöklafræði við þjóðveg 1. Haustráðstefna JFÍ, Kirkjubæjarklaustri, 5.-7. október 2012. The impact of volcanic tephra from two eruptions on the energy- and mass balance of Langjökull ice cap, SW-Iceland. AGU Fall Meeting, San Francisco, 3-7 December 2012. IGS Nordic Branch Meeting, Stockholm, Sweden, 25 - 27 October 2012. H. Björnsson, S. Guðmundsson, F. Pálsson, E. Magnússon, Throstur Thorsteinsson and H. H. Hannesson. The impact of volcanic tephra aerosols on glacier melting. CRAICC Annual meeting, Hótel Rangá, 10 - 14 October 2011. Throstur Thorsteinsson, Thorsteinn Johannsson, and Gudrun Petursdottir. High levels of particulate matter due to ash plume and ash re-suspension following the Eyjafjallajökull eruption. Vorráðstefna Jarðfræðafélagsins 2011. 15 April 2011. Tephra, mass- and energy balance: the influence of the Eyjafjallajökull eruption 2010 on Icelandic ice caps. Vorráðstefna Jarðfræðafélagsins. 15 April 2011. Erin C Pettit, Ed Waddington, Throstur Thorsteinsson, Alessio Gusmeroli, Joseph Kennedy, Catherine Ritz, Regina Carns. Using Borehole Sonic Logging to Infer Ice Microstructure and Climate History. Christopher Hoyle, Valeria Pinti, André Welti, Claudia Marcolli, Bernhard Zobrist, Björn Hannes Mattsson, Throstur Thorsteinsson, Guðrún Larsen, and Thomas Peter. Sverrir Guðmundsson, Finnur Pálsson, Helgi Björnsson, Þröstur Þorsteinsson and Hannes H. Haraldsson. Tephra, mass- and energy balance: influence of the 2010 Eyjafjallajökull eruption on Icelandic ice caps. Institute of Earth Sciences, University of Iceland, Spring Seminar Series, 3 Mars 2011. Sverrir Guðmundsson, Finnur Pálsson, Helgi Björnsson, Eyjólfur Magnússon and Þröstur Þorsteinsson. Observations and modelling of Icelandic ice caps. NCoE CRAICC kickoff meeting, Helsinki, Finland, 1-3 Februar 2011. Re-suspended material and Particulate Matter pollution. Friday seminar series, Institute of Earth Sciences, University of Iceland, 22 October 2010, Askja. Sverrir Guðmundsson, Helgi Björnsson, Finnur Pálsson and Þröstur Þorsteinsson. International Glaciology Society - Nordic Branch Meeting 2010. 28 - 30 October 2010. Throstur Thorsteinsson, Hrobjartur Thorsteinsson, Inga Rún Helgadóttir and Hrund Valgeirsdóttir. Improving ash and eruption detection with satellites. Engineering and Natural Sciences Research Symposium 2010, University of Iceland, 8 - 9 October 2010. Magnus Tumi Gudmundsson, Thor Thordarson, Armann Hoskuldsson, Gudrun Larsen, Ingibjörg Jónsdóttir, Bjorn Oddsson, Eyjolfur Magnusson, Thordis Hognadottir, Gudrun Sverrisdottir, Niels Oskarsson, Throstur Thorsteinsson, Kristin S Vogfjord, Halldor Bjornsson, Gudrun Nina Pedersen, Steinunn Jakobsdottir, Sigurlaug Hjaltadottir, Matthew J Roberts, Gunnar B Gudmundsson, Snorri Zophoniasson, Fridrik Hoskuldsson. The Eyjafjallajökull eruption in April-May 2010; course of events, ash generation and ash dispersal. Larsen, G, Thordarson, T, Hoskuldsson, A, Gudmundsson, M T, Sverrisdottir, G, Oddsson, B, Oskarsson, B V, Jonsdottir, I, Oladottir, B, Thorsteinsson, T, Hartley, M E, Meara, R. 2010. On-land distribution and modes of deposition of the Eyjafjallajökull 2010 tephra. Abstract V53F-04 presented at 2010 Fall Meeting, AGU, San Francisco, Calif., 13-17 Dec.
A. Stohl, N.I. Kristiansen, S. Eckhardt, J.F. Burkhart, U. Baltensperger, M. Pavolonis, F. Prata, T. Thorsteinsson, and K. Tørseth. Modeling and forecasting the distribution of volcanic ash from the Eyjafjallajökull eruption (solicited). Throstur Thorsteinsson, Sven Þ. Sigurðsson, Sverrir Guðmundsson, Eyjólfur Magnússon, Helgi Björnsson, Guðfinna Aðalgeirsdóttir, and Finnur Pálsson. 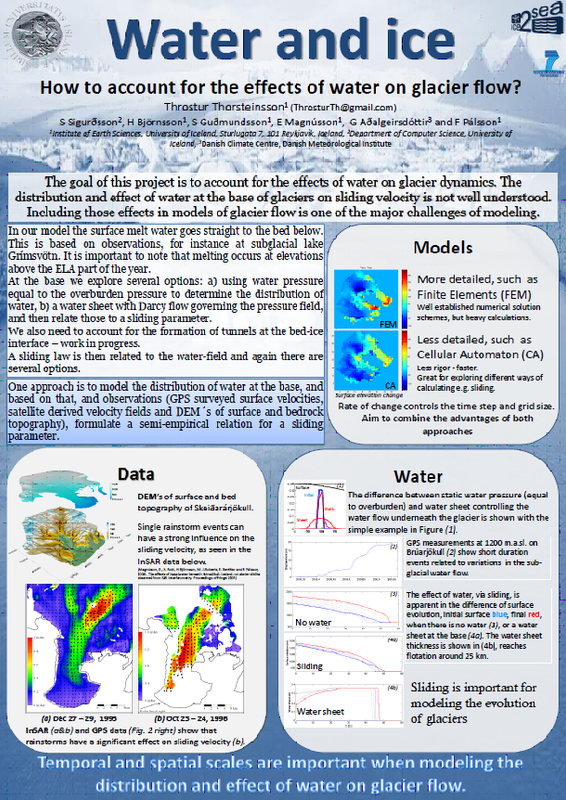 Water and ice:How to account for the effects of water on glacier flow? Vorráðstefna Jarðfræðafélags Íslands, 26 March 2010, Askja. Fjarkönnun og veðurfarstengd náttúruvá: Gróðureldar. Haustþing Veðurfræðifélagsins, 21 October 2009, Víðgemli in Orkugarður. Hróbjartur Þorsteinsson og Þröstur Þorsteinsson. 2009. Greining á gosösku og sandstormum með gervitunglagögnum. Lake ice formation on Þingvallavatn. Þröstur Þorsteinsson, Borgþór Magnússon og Guðmundur Guðjónsson. 2009. Mapping the spread and intensity of a large wildfire in Iceland in 2006. Mapping and Monitoring of Nordic Vegetation and Landscapes, 16 – 18 September 2009, Hótel Örk, Iceland. Olga K. Vilmundardóttir, Borgþór Magnússon, Guðrún Gísladóttir, and Þröstur Þorsteinsson. 2009. Shoreline erosion and aeolian deposition along a recently formed reservoir, Blöndulón, Iceland. Samspil þróunar og síbreytilegs umhverfis - veðurfar og þróun mannsins. Endurmenntun Háskóla Íslands (námskeið fyrir framhaldsskólakennara "Líf í alheimi"), Verslunarskóli Íslands, Reykjavik, 16. júní, 2009. Hvers vegna svona stóran heila ? Particulate matter pollution - A modeling horror story. Friday seminar series, Reykjavik, October 24, 2008. Þröstur Þorsteinsson - Helgi Björnsson, Sverrir Guðmundsson og Finnur Pálsson. Glaciers slipping and sliding in Iceland. ESF workshop, Mallorca, Spain. May 27 - 29, 2008. Near surface fabric and fabric evolution. ESF workshop, Göttingen, Germany. April 9 - 11, 2008 (invited). Ráðstefna slökkviliðsstjóra 2008, Grand hótel, 3. apríl, 2008. Raunvísindaþing 2008, 14-15. mars, 2008. Viðtal við Leif Hauksson, þátturinn Samfélagið í nærmynd á Rás 1, 6. febrúar, 2008. Hrafnaþing, Möguleikhúsinu, 6. febrúar, 2008. Tengsl umferðar við styrk svifryksmengunar. Rannsóknarráðstefna Vegagerðarinnar 2007, Hótel Nordica, 2. nóvember, 2007. Þröstur Þorsteinsson, Borgþór Magnússon og Guðmundur Guðjónsson. Vorráðstefna Jarðfræðafélags Íslands, Öskju, Háskóla Íslands, 27. apríl, 2007. Útbreiðsla og styrkur Mýraelda metinn með gervitunglagögnum. Borgþór Magnússon, Guðmundur Guðjónsson, Þröstur Þorsteinsson og Bjarni Kristinn Þorsteinsson. Framvinda Mýraelda 2006 og landið sem brann. Fræðaþing landbúnaðarins, Hótel Sögu, mars 2007. Útbreiðsla Mýraelda könnuð með gervitunglum. Kynningarfundur á Mýrum, mars 2007. Vorráðstefna Jarðfræðafélags Íslands, Öskju, Háskóla Íslands, 2006. G. Durand, O. Gagliardini, T. Thorsteinsson, A. Svensson, S.Kipfstuhl, D. Dahl-Jensen. Ice microstructure and fabric: an up to date approach to measure textures. Steps towards including DYNAMIC RECRYSTALLISATION in a model of fabric evolution for ice. Málþing fyrir útektarnefnd á Jarðvísindastofnun, 15. maí. Chair of Local Organizing Committee, Askja, júní. Ed Waddington, ThrosturThorsteinsson, Larry Wilen, Charlie Raymond. What do thin-section fabric diagrams really tell us? NWG Fairbanks, Sept. 16., 2006. Þröstur Þorsteinsson, L. Wilen, and E. D. Waddington. 2005. Upplýsingar um stefnuhneigð frá þunnsneiðargögnum. Vorráðstefna Jarðfræðafélags Íslands, Öskju, Háskóla Íslands, 9. apríl, 2005. Modeling and characterizing anisotropy of ice (and other materials). Þröstur Þorsteinsson, L. Wilen, and G. Lamorey. 2004. Throstur Thorsteinsson, K. Matsouka, I. Howat, E. Waddington, S. Tulaczyk, and S. O’Neel. 2004. EGU Spring Meeting, Nice, France. April 2004 (poster). Relating bed topography and lubrication to surface topography and velocity. EGS Spring meeting, Nice, France. Session OA28.04: Glaciers and ice sheets: CONTROL OF BASAL PROCESSES ON MOTION AND MASS BALANCE. Convener: Tulaczyk, S.; Co-Convener(s): Fischer, U.H. 2002. Throstur Thorsteinsson, Edwin D. Waddington, and Raymond C. Fletcher. 2002. IGS symposium: Physical and Mechanical Processes in Ice in relation to Glacier and Ice-sheet Modelling, Chamonix Mont-Blanc, France, 26-30 August 2002. Fabric development with nearest neighbour interaction and dynamic recrystallization. Throstur Thorsteinsson and Edwin D. Waddington. 2001. Folding in strongly anisotropic media. IGS symposium: Ice Cores and Climate, Kangerlussuaq, Greenland, 17-23 August 2001. Fabric development with nearest neighbor interaction and dynamic recrystallization. AGU Fall Meeting, San Francisco, CA, 2000 (poster). Throstur Thorsteinsson, R. Bindschadler, G. H. Gudmundsson and C. F. Raymond. 1999. Bed topography and stickiness inferred from surface measurements on ice streams. West Antarctica Ice Sheet Meeting, Algonkian Meeting Center in Sterling, VA, Sep. 16-18, 1999. Throstur Thorsteinsson and C. F. Raymond. 1998. Sliding versus till deformation in the motion of an ice stream over deformable till. Chapman Conference on West Antarctic Ice Sheet, Orono, Maine, 1998 (poster). Throstur Thorsteinsson, E. D. Waddington, C. F. Raymond and K. C. Taylor. 1998. Combined effects of temperature, fabric and impurities on the mechanical properties of ice. AGU Fall Meeting, San Francisco, CA, 1998 (poster). The Role of Anisotropy and Impurities in Deformation of the Dye3 borehole. EISMINT Workshop on Ice Rheology at Grindelwald, Switzerland, 26-30 September 1997.